When it comes to Super Bowl XLVI on Sunday, Mr. Purple is all over Big Blue. Donny Osmond, who won this year’s Vegas celebrity picks contest with a 28-22-1 record against the point spread (a strong 56 percent clip), predicts the underdog New York Giants will beat the New England Patriots. Osmond said the determining factor is one of football’s oldest, tried-and-true formulas for success. “Everyone says defense wins championships, and if that’s the case, I think the Patriots have had one of the worst defenses throughout the season,” he said. New England’s defensive unit was 31st in the NFL this season, allowing an average of 411.1 yards per game, only a half-yard per game better than the league’s worst defense, Green Bay. No team in history has won a Super Bowl with a defensive that poor. The New Orleans Saints in 2009 allowed 357 yards per game during the season, most ever for a Super Bowl-winning team. Osmond said the Giants defense (which ranked 27th in the league and is only the second team to allow more than 400 points and reach the Super Bowl) is still far superior and will be the difference-maker. “The Giants are going to win based on their stronger defense, period,” he said. 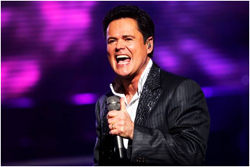 Osmond won the celebrity contest by a game over Tara Palsha, prinicipal dancer in Vegas — The Show at Planet Hollywood and by two games over comedy hypnotist Marc Savard.